Are you looking for a new alarm clock? AlarmClocksOnline.com is your #1 choice for alarm clocks -- because we are the experts! We have hundreds of clocks to choose from in a variety of different styles, colors, and prices. You can choose from an analog styled clock to a digital one. 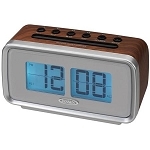 Our alarm clocks can vary from old, retro, 1950 styled clocks to modern 2013. Depending on your desire, we have wind up alarm clocks, clocks that do or do not tick, or clocks with or without a built in radio. We have clocks for children, clocks that run on battery, or ones that plug directly into an outlet. For those of you who prefer to be waken up to something other than a typical "alarm" sound, we have clocks that can wake you up to the radio, sounds of nature, or to animal noises. You'll also find clocks that can dock your mp3 player. Alarmclocksonline.com can also be a great place to find a gift for a loved one or a coworker. With our vast assortment of clocks, you can find the perfect gift for whomever it may be. Get your husband that new mp3 dock he's been hoping for, your coworker a nice digital clock to put on his desk, or grandma a new large faced alarm clock so that she can read it without difficulty. The options are endless. Our clocks are made from the top names in the business, such as Bulova, Timex, Sonic Alert, and more. Please feel free to call with any questions. We are happy to help!